One particular area of opportunity for improving revenue is mitigating losses within the arena of claim denials. Claim denials are costly and may occur anywhere within the revenue cycle. The rate at which different payers deny claims varies significantly. The American Medical Association’s National Health Insurer Report Card has suggested that denial rates may be as low as 0.5% in some commercial payers, while Medicare denial rates have hovered just over 4%.4 The accepted benchmark in the industry is about 2% for hospitals, which translates into millions of dollars of lost revenue annually. Change Healthcare reported managing 1.8 billion claim denial transactions in 2016, with a total value of over $3 trillion - representing approximately $4.9 million, or 3.3% of net patient revenue, per hospital.5 Given that most hospitals now operate on a 2% operating margin on average, the impact of claim denials can be staggering. A large percentage of claim denials can be attributed to processes that occur during registration, authorization, and eligibility. While education of front end staff is necessary and can be impactful, provision of tools to staff is essential to success. 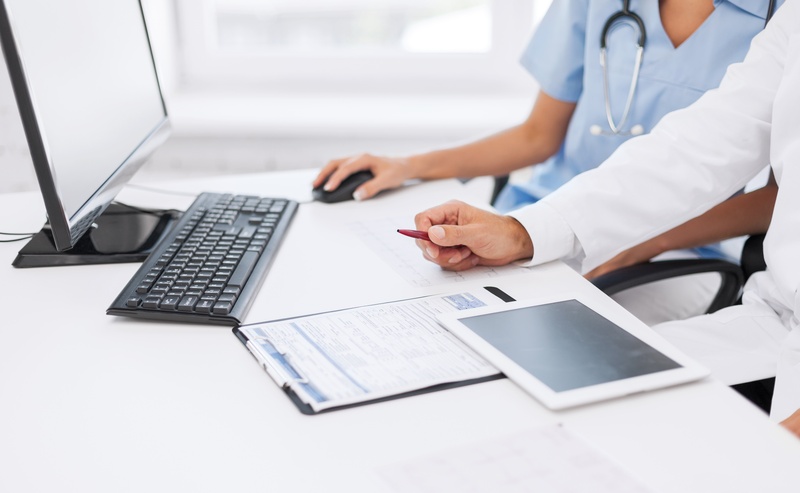 Registration and scheduling systems can be used to assist staff in ensuring that complete and accurate information is collected from the beginning of a patient encounter, and that eligibility requirements are met. This will affect the rate of denials related to claims for services not covered and those requesting additional information. However, use of these systems may not impact another large contributor to claims denials – those for medical necessity and lack of prior authorization. Increasing rates of claim denials attributed to medical necessity is likely to be common in the Medicare and Medicaid patient populations. In order to demonstrate medical necessity, documentation supporting the diagnosis and level of care provided must be consistent. Those services excluded from coverage by Medicare Part A and Part B are those that “are not reasonable and necessary for the diagnosis or treatment of illness or injury or to improve the function of a malformed body member”. Importantly, Medicare Part A pays only inpatient claims, while outpatient services are covered by Medicare Part B. As such, claims must be scrutinized by Medicare to ensure not only the appropriate services were provided, but also that they were provided in the appropriate setting. In 2011, approximately 20% of improper payments to Medicare Part A and Part B claims were due to inappropriate setting.11 This is of particular consequence for CMS because the reimbursement rate for inpatient admissions is higher than outpatient reimbursement, as it is meant to include support for inpatient operating costs. Documentation to support an inpatient status includes physician orders to admit the patient with the expectation that the patient will require a stay that spans at least 2 midnights or the patient is undergoing a procedure that has been included on the Inpatient-Only list.11,12 Therefore, a hospital may provide appropriate and necessary services that nevertheless result in a claim denial for the entire amount billed due to incorrectly assigned status. The registration staff that are responsible for determining and entering the status for patients undergoing inpatient and outpatient procedures are unlikely to be trained in clinical practice or medical coding. Education of staff may have limits, as it is implausible for these personnel to commit frequently changing “inpatient procedure-only” lists that vary by payer to memory. Registration staff are unlikely to have adequate time to manually check the policies related to inpatient or outpatient status for each procedure scheduled.13 Manual research of this type is doubtless to be inconsistent between staff members, leading to errors and inefficiencies across the board. Furthermore, in the case where a patient may be incorrectly assigned an outpatient status, utilization management staff would not provide a notice of admission to the payer, resulting in denial due to lack of precertification/authorization. The need for a tool that includes all of this information, which is continually up-to-date, and is easily accessible to registration and scheduling staff is necessary to help prevent claim denials attributable to incorrect inpatient status. 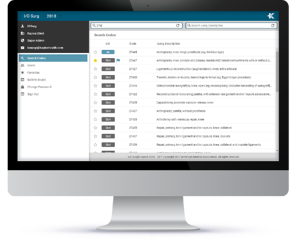 I/O Surg is a solution for identification of the proper codes and inpatient/outpatient status per CMS addendum B and E. This search engine requires only 2 clicks in order to identify the status, eliminating the need for manual research of reference books, lists, or websites. Staff can easily search the database by providing either the CPT code or part of the description in order to locate the appropriate procedure; the correct billing code and patient status are then communicated throughout the entire system. Importantly, I/O Surg can be used throughout the entire revenue cycle to prevent claim denials due to patient status and lack of authorization. Specifically, the application is useful for: physician and nursing staff to ensure the correct procedural code is applied for surgical interventions; office staff to verify the codes are applied during the practical process; pre-op staff to ensure the correct inpatient/outpatient status are applied preprocedurally; and utilization management and coding staff to determine whether post-operative change in surgical procedure is required. Each staff member is able to create an individual profile to save their most frequently used codes and procedures for quick reference. At ProMedica, a process improvement initiative to optimize billing processes and enhance revenue cycle management was undertaken in 2017. I/O Surg was included in this multipronged approach; deployment for staff use began at a single hospital in June 2017 and was fully implemented throughout the system in Fall 2017. The application is used daily throughout the revenue cycle. Pre-operatively, pre-access staff use a coding tool to apply CPT codes to free text associated with scheduled services. 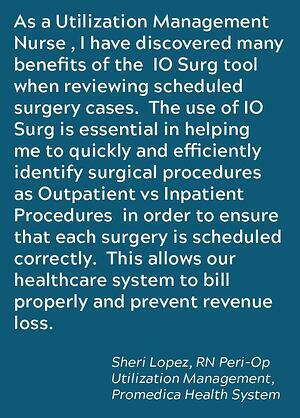 I/O Surg is then used for every inpatient procedure to confirm accurate coding and status. I/O Surg is also used in this capacity to verify certain outpatient procedures as well, particularly those in which modifiers may impact status (i.e. open versus laparoscopic approach for cholecystectomy). Utilization management nurses also use I/O Surg pre-operatively using only procedure name (or part of the procedure name). Utilization management staff focused on concurrent denials use I/O Surg to check inpatient denials as they occur, as overturning a decision prior to adjudication or appeal has a higher success rate. Finally, I/O Surg is used postoperatively as utilization management staff review operative notes to ensure procedures did not change and to reference inpatient insurance denials. Account write-offs for claim denials in which no prior authorization or medical necessity was cited as the reason for denial were compared over the 2017 calendar year at a single urban tertiary hospital. Claim denials that resulted in a write-off were compared in all inpatient surgical admissions during the time-frame of interest. It was assumed that though I/O Surg could not prevent all denials related to medical necessity or no precertification/ authorization, a reduction in either (or both) of these would occur if the use of the application was successful in guiding appropriate registration of these admissions and procedures. Figures are reported as the gross charges that were denied; net cost savings is calculated as 21% of the gross charge. Because I/O Surg was designed to guide registration of surgical procedures, analysis of only inpatient surgical admission claim denial write-offs were compared. 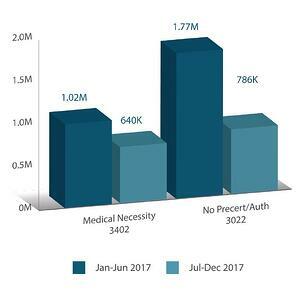 During the first half of 2017 (January through June), approximately $1.02M in charges were denied by CMS due to lack of medical necessity, with an additional $1.77M in charges denied due to no prior authorization being obtained. After I/O Surg was integrated into use, the figures related to medical necessity denials were reduced to $640,000 between July and December 2017, while no prior authorization denials dropped to $786,000. These reductions translate into denial avoidance for $1.36M of CMS gross charges (about $300,000 net). Based on this initial data, one can reasonably presume an extrapolated annual reduction of approximately $600,000. For multi-hospital systems like ProMedica, the avoided losses could be significantly higher, depending on the number of hospitals and the volumes of inpatient admissions. These estimates of denial avoidance do not include any of the outpatient procedures that were guided by I/O Surg. One could expect that over time, as staff become more accustomed to using the application on a daily basis and it becomes a routine part of training and orientation procedures, applicable denials would continue to decrease. Importantly, one limitation of the current financial analysis is that I/O Surg was one of many interventions implemented during initiatives to transform the revenue cycle management processes within this institution. However, I/O Surg is believed to be a major contributor to improvements in write off amounts observed in the inpatient surgical cohort described. I/O Surg is a quick and easy to use tool that can be combined with existing practices to support time and money savings by preventing claim denials before they occur. Use of this application throughout the revenue cycle within an integrated process can result in improvement of reimbursement rates for inpatient surgical procedures and may help reduce time spent appealing denials on the back end. At Kapios, we create technology because it is our passion. When we saw the far-too-many obstacles standing in the way of our healthcare providers, we knew we could help. We began to share our passion and create solutions to reduce the challenges in our healthcare community. We are using our technological capabilities to allow them to do what they do best. In the end, we hope our love for technology will make a difference in the lives of those who need it most. Contact us for more information. 1. Survey: Healthcare Finance, Governmental Mandates, Personnel Shortages Cited by CEOs as Top Issues Confronting Hospitals in 2017 [press release]. American College of Healthcare Executives. 2018. 2. Kacik A. Not-for-profit hospitals’ cost-cutting isn’t keeping up with revenue decline. Modern Healthcare. 2018. 4. LaPointe J. How to Maximize Revenue with Improved Claims Denials Management. Revenue Cycle https://revcycleintelligence.com/features/how-to-maximize-revenue-with-improved-claimsdenials-management. 5. Bean M. 7 strategies to prevent claims denials. Becker’s Hospital CFO Report. 2017. 7. Lachney K. Medical Billing Denials Are Avoidable: How to Help Prevent the Top 5. 2016; https://www.changehealthcare.com/blog/medical-billingdenials-avoidable/. 8. Haines M. An ounce of prevention pays off: 90% of denials are preventable. 2014; https://www.advisory.com/research/financial-leadershipcouncil/at-the-margins/2014/12/denialsmanagement. 9. LaPointe J. 3 Best Practices for Hospital Claim Denials Management. Reimbursement News https://revcycleintelligence.com/news/3-best-practices-for-hospital-claim-denials-management. 10. Gooch K. 65 RCM tips from 2017. Becker’s Hospital Review. 2017. 11. Gustafson JL, Pendleton A. Billing for and Appealing Denials of Inpatient Hospital Services. ABA Health Lawyer. 2013;26(2):1-16. 12. Locke C, Sheehy AM, Deutschendorf A, Mackowiak S, Flansbaum BE, Petty B. Changes to inpatient versus outpatient hospitalization: Medicare’s 2-midnight rule. Journal of hospital medicine. 2015;10(3):194-201. 13. Hoppe K. Preventing Medical Necessity Denials. 2016; https://www.hfma.org/Content.aspx?id=49301.